1969 was a watershed year in my life. In February I left the De La Mennais Brothers’ juniorate at Woolton College in Liverpool and returned to St. Mary’s College in Southampton to finish Fifth Form and complete my ‘O’ Levels. And in August, I emigrated to Canada and joined my family in Burlington, Ontario. During the few weeks between the end of school and the day I left England, I took a job as a paper-boy. Now, unlike the North American set-up - where a newspaper deliverer works for one newspaper company, and only delivers their particular paper - in England you worked out of a newsagent’s shop, and delivered about a dozen different papers to the houses on your route. I was working for a shop on Hollybank Estate in Hythe - the village I grew up in - so the route was familiar to me. And I had my bicycle to carry me faster between certain spread-out sections of the route. It became an educational experience to see how the different types of newspapers (broadsheets, tabloids, etc.) targeted the same news at their particular audience. As I pulled out each paper from the diverse collection in my shoulder-bag, and walked up to shove it through the letter-box of each house, I had time to give it a quick perusal – to scan the pictures, headlines, and, perhaps, an article's opening paragraph. And during those few weeks, the continuing news story of most interest to me was the impending flight of Apollo 11, which was going to attempt to put two men (Neil Armstrong and Buzz Aldrin) on the surface of the moon. Some papers covered the mission in a rather cursory manner (other things, strangely, seemed of more importance to their editorial concerns); others provided in-depth coverage, with feature articles, photo essays, and special supplements. 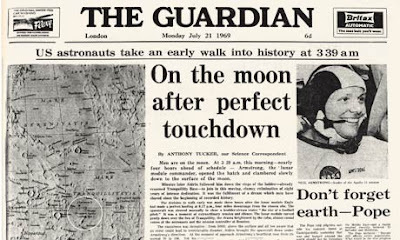 During the intense, week-long duration of the Apollo 11 flight itself, in late-July, I followed the newspaper coverage with deep interest – buying one or two of that day’s newspapers, when I got back to the shop at the end of my run. And the climax of the Apollo 11 mission could not have been more dramatic for me. The TV coverage, of course, was geared to put the important events on prime-time broadcasts in the United States (EST) – but that meant five hours later in the UK (GMT). The Lunar Module landed on the Moon at 8:17 p.m. GMT. The two astronauts aboard (Armstrong and Aldrin) were given about five hours to sleep before the intense and exhausting exploration of the moon’s surface. That meant the TV coverage of those first steps on the Moon would not happen until about 2:30 the next morning (GMT). Not to be missed, of course. But I had to go up by train the next day to visit Canada House in Trafalgar Square, in order to sign a couple of immigration documents. So, I set the alarm and got about four hours sleep – getting up to watch the BBC-TV coverage of the momentous event. Neil Armstrong, after careful preparation, stepped onto the Moon’s surface at 2:56 a.m., on the morning of Monday, July 21st, 1969. I watched for another hour or so, and then got back to bed for a few hours sleep, before getting up again to make my train journey to London. By the end of that momentous day, I was thrilled by the sense of its historical import, but tired after the long hours of travel. So, the Apollo programme was of intense interest to me. During our recent March Break holiday in Florida, therefore, whilst Barb and Gillian went off to Harry Potter World, on our first day there, Colin and I went east to the Kennedy Space Center (KSC) at Cape Canaveral. As we got close to the visitors’ complex, we knew we were in the right place – half a dozen rockets were poking above the facility's outer fencing. After showing our tickets at the gate, we made our way over to the rockets – collected in an area referred to as “the Rocket Garden”. Here were housed some of the key rocketry of the three programmes of the 1960s American space effort – Mercury, Gemini and Apollo. Here are the two rockets of the early-sixties' (1961-1963) Project Mercury. The rocket on the right is called the Redstone-Mercury. It is a one-stage rocket, eighty-three feet long, used for sub-orbital flights. It was used in May and July of 1961 in the first American manned flights - putting first Alan Shepard and, then, Gus Grissom into fifteen-minute sub-orbital flights. The rocket on the left is the Atlas D. It's a two-stage rocket, and was used to put the other Mercury astronauts into earth orbit: John Glenn in February, 1962 (three orbits); Scott Carpenter in May, 1962 (three orbits); Walter Schirra in October 1962 (six orbits); and Gordon Cooper, who did twenty-two orbits of the Earth, and was the first American astronaut to stay in space for more than a day. The 1983 film The Right Stuff, based on a book by Tom Wolfe (1979), was focused primarily on the history of the Mercury program. The manned flights of the Gemini program ran from March 1965 to November 1966. The launch vehicle used for all those flight was the Titan II - pictured above (left-foreground). This rocket was built by the U.S. Air Force and, like the Mercury-Atlas rocket, was originally designed for use as a missile to deliver nuclear weapons. The Titan II was 109 feet long. It was a two-stage, liquid-propelled rocket. The Saturn 1B rocket is the largest rocket displayed in the Rocket Garden. It's so big they cannot safely display it upright. It is 141 feet long and composed of two stages. It was used in several unmanned Apollo flights designed to test systems and equipment being developed for the program: the Apollo 5 unmanned mission tested the Lunar Excursion Module (LEM) for the first time (in Earth orbit); and the Apollo 7 mission took the first three-man crew into Earth orbit for 11 days. This is the actual gantry that was used by all the Apollo missions, including Apollo 11 in July, 1969. It sat atop Launch Pad 39A. The three astronauts would walk across this gantry in order to get into the command module at the top of the huge Saturn V rocket. It must have been an intimidating and rather scary moment to realise what they were about to do. The large building at the back of this shot is the Vehicule Assembly Building (VAB). This is the view taken from an observation tower near Launch Pad 39A, from where all the Apollo missions were launched. The VAB is a huge one-storey building, within which the huge three-stage Saturn V rockets were assembled. It was built in 1965. The VAB is 526 feet (160.3 m) tall and covers eight acres. It was designed to hold four separate Saturn V rockets in various stages of construction. The building has 10,000 tons of air-conditioning equipment, including 125 ventilators on the roof, to keep moisture under control. The interior volume of the building is so vast that it has its own weather - small clouds form below the ceiling on very humid days. This building was also used to assemble the Space Shuttle prior to each flight - attaching the three fuel tanks used to put it in Earth orbit. This is Launch Pad 39A, photographed from the observation tower about 1.5 miles away. It was used as the launch site for all the Apollo Moon missions. The vehicles would be transported from the VAB to the Launch Pad on the gigantic transporters ("crawlers") on the specially-constructed "crawlerways". The crawlerway (seen in the foreground) is a 100 ft-wide (30m) double-pathway that leads to the Launch Pads 39A and 39B. A seven-foot deep (2 m) bed of stones lies beneath a layer of asphalt and a surface made of Alabama river rocks. It is 3.5 miles from the VAB to Launch Pad 39A. The maximum speed of the crawler was 1 mph (1.6 kmph); it would take it about five hours to get a Saturn V rocket to the launch pad. This lauch pad was adapted later for the launches of the Space Shuttle. After you leave the observation Tower near the launch pads, the KSC bus takes you to the most impressive element of the Kennedy Space Center - the Apollo/Saturn V Center. This building lies north-west of Launch Complex 39. It was completed in 1996, built primarily to house a restored Saturn V launch vehicle, but it also houses various exhibits related to the Apollo program. The structure was erected around the original Apollo "firing room" - the communications centre which controlled all the launches of the Saturn V rockets. It provides an impressive ten-minute simulation of the environment inside the firing room during the launch of Apollo 8. Eight seconds after the rocket left the launch pad, control for the mission would switch to the Johnson Mission Control Center in Houston, Texas. Colin stands near the base of a Saturn V rocket - to give a sense of its enormous size. It stood 363 feet high - as tall as a 36-storey building. Its name comes from the five F-1 engines at the bottom of its first stage, and the five J-2 engines attached to the second stage. It is the largest, and most powerful, rocket ever built. The Saturn V was designed under the direction of Wernher von Braun and Arthur Rudolph and built by Boeing Corporation - they constructed fifteen of the rockets. The Saturn V was propelled by a mixture of liquid hydrogen and liquid oxygen. Each rocket contained three million parts: fuel lines, pumps, sensors, gauges, circuits and switches. It had to lift 285,000 pounds into Earth orbit, and then 107,000 pounds to the moon. The second stage of the Saturn V rocket was 81 feet long (25 m). It would burn for 6 minutes and 24 seconds, and accelerate the Saturn V through the upper atmosphere with 5.1 mega-newtons of thrust. The Saturn V's ring-shaped Instrument Unit sat between the rocket's third stage and the SLA panels, which housed the the Lunar Excursion Module. It was built by IBM. This computer controlled the operations of the rocket from just before lift off until the third stage was discarded. It included guidance and telemetry systems for the rocket. By measuring the acceleration and vehicle attitude, it could calculate the position and velocity of the rocket and correct for any deviations. You may be familiar with film shot from the top of the rocket looking back at the Earth, which shows the ring turning over as it tumbles back into the upper reaches of the atmosphere. Here's my son Colin touching a small piece of Moon rock. The Apollo 14 crew were Alan Shepard (who was the first American astronaut to fly - a sub-orbital fifteen-minute flight in May, 1961; Shepard was also the only Mercury astronaut to fly to the Moon), Stuart Roosa, and Edgar Mitchell. Shepard and Mitchell were on the Moon on February 5th and 6th, 1971. One of my favourite shots from the photos I took at the Saturn V/Apollo Center at the Kennedy Space Center. The astronauts had casts made of their hands, in order to ensure that the gloves of their space suits fitted properly. The casts done for the three Apollo 11 astronauts - Michael Collins (the Command Module pilot), Buzz Aldrin (Lunar Module pilot) and Neil Armstrong (Commander) - were mounted in a display. It makes for a very evocative sculpture, don't you think? If you are at all interested in the American space program, and are ever in the Orlando region of Florida, I highly recommend a visit to the Kennedy Space Centre. It's about an hour's drive east of Orlando. Film Review: "The Wildest Dream"
Saints promoted to Premier League!